Welcome: One Billion ~ What does Billion actually mean? One Billion ~ What does Billion actually mean? Subject: One Billion ~ What does Billion actually mean? ~ What does Billion actually mean? The number equivalent to the product of a thousand and a million; 1,000,000,000 or 109.
example... "a world population of nearly 5 billion". This method used is currently popular and is known as the Short Scale. Another method used is called the Long Scale which is not popular probably because it is impossible, very remote & non-realistic in most cases & usage. This is what started this question once again! Oiy! The figures correct or not? ... so the editor missed 3 big important zeros. ... BUT in an exam... he or she will get ONE BIG ZERO! WHEN Malaysia holds its next general election in 2018, a law should be in place requiring political parties to disclose all funding from foreign sources and local interest groups so as to prevent electoral meddling, said the minister tasked with fostering political integrity in the country. The announcement came as questions persist over the origin of the RM2.6 billion (S$875,000) found to have been deposited into Prime Minister Najib Razak's personal account before the 2013 general election. 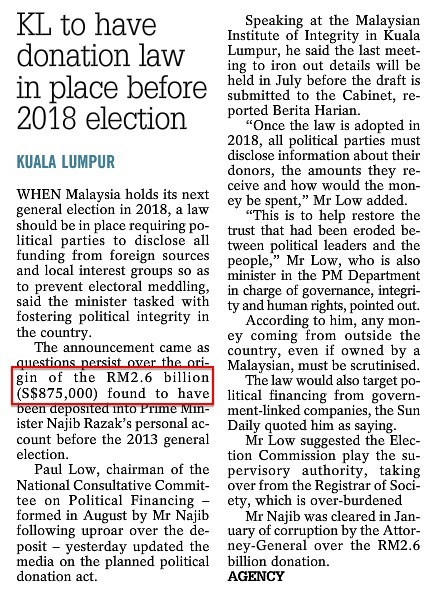 Paul Low, chairman of the National Consultative Committee on Political Financing - formed in August by Mr Najib following uproar over the deposit - yesterday updated the media on the planned political donation act. Speaking at the Malaysian Institute of Integrity in Kuala Lumpur, he said the last meeting to iron out details will be held in July before the draft is submitted to the Cabinet, reported Berita Harian. "Once the law is adopted in 2018, all political parties must disclose information about their donors, the amounts they receive and how would the money be spent," Mr Low added. "This is to help restore the trust that had been eroded between political leaders and the people," Mr Low, who is also minister in the PM Department in charge of governance, integrity and human rights, pointed out. According to him, any money coming from outside the country, even if owned by a Malaysian, must be scrutinised. The law would also target political financing from government-linked companies, the Sun Daily quoted him as saying. Mr Najib was cleared in January of corruption by the Attorney-General over the RM2.6 billion donation. Every new term greater than million is one million times larger than the previous term. Thus, billion means a million millions (1012), trillion means a million billions (1018), and so on. Every new term greater than million is one thousand times larger than the previous term. Thus, billion means a thousand millions (109), trillion means a thousand billions (1012), and so on. For other uses, see Billion (disambiguation). Another word for one thousand million is milliard, but this is used much less often in English than billion. Some languages, such as French or German, use milliard (or a related word) for the short scale billion, and billion (or a related word) for the long scale billion. Thus the French or German billion is a thousand times larger than the modern English billion. According to the Oxford English Dictionary, the word billion was formed in the 16th century (from million and the prefix bi-, "two"), meaning the second power of a million (1012). This long scale definition was similarly applied to trillion, quadrillion and so on. The words were originally French, and entered English around the end of the 17th century. Later, French arithmeticians changed the words' meanings, adopting the short scale definition whereby three zeros rather than six were added at each step, so a billion came to denote a thousand million (109), a trillion 1012, and so on. This new convention was adopted in the United States in the 19th century, but Britain retained the original long scale use. France, in turn, reverted to the long scale in 1948. In Britain, however, under the influence of American usage, the short scale came to be increasingly used. In 1974, Prime Minister Harold Wilson confirmed that the government would use the word billion only in its short scale meaning (one thousand million). In a written answer to Robin Maxwell-Hyslop MP, who asked whether official usage would conform to the traditional British meaning of a million million, Wilson stated: "No. The word 'billion' is now used internationally to mean 1,000 million and it would be confusing if British Ministers were to use it in any other sense. I accept that it could still be interpreted in this country as 1 million million and I shall ask my colleagues to ensure that, if they do use it, there should be no ambiguity as to its meaning." Sample of my potential movement to stop Chain Messages. Also, describes briefly what 1 Billion actually mean. Warning! Potential Chain Email Message! One Billion Educational Chain Message Warning! Today, with the click of a button, a message can be forwarded to hundreds of people at no apparent cost to the sender. If each of these "Good Samaritans" send the message to only ten other people (and most send to huge mailing lists), the ninth re-sending results in a billion messages, thereby, clogging the network and interfering with the receiving of legitimate e-mail messages. Factor in the time lost reading and deleting all these messages and you see a real cost to organizations and individuals from these seemingly innocuous messages. How do you recognize a chain letter? They all have a similar pattern. They all expect you to re-send the message, either by threat or by guilt, e.g. Will you e-mail this message to all on your mailing list, and ask them to pass it along to all on theirs? The Blue Eraser DOES Erase Ink!